The Chateau de Gratot might be partly ruined, but its spectacular silhouette take your breath away as you enter its walled enclosure. Two of its towers dart into the sky and give you a clear idea of how impressive it once looked. The walls of the fortified house the Argouges family built in the 13th century are still visible in the foundations of the castle that replaced it 2 centuries later; so is the northern side, which was integrated to the new building. The ramparts initially encompassed the castle’s church and farm, today both located outside the deep moat. The Tour Ouest (west tower), a corner tower now adjacent to the commons, is another remnant of the medieval fortress; it served as main entrance and was part of the rampart. The current entrance gatehouse replaced it in the 16th century. A stone bridge replaces the drawbridge that protected the pedestrian and carriage doors, but the grooves where the beams were anchored are still visible in its facade. Their dormers are adorned with three granite balls overlooking a half-sun; these attributes showed the owners’ social status and exempted them from certain taxes. 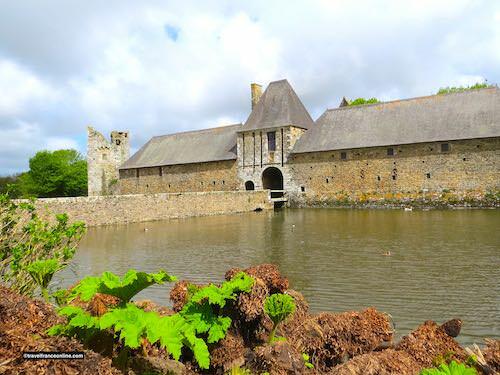 Sixteen generations of Argouges owned and remodeled the Chateau de Gratot from 1251 until 1711. 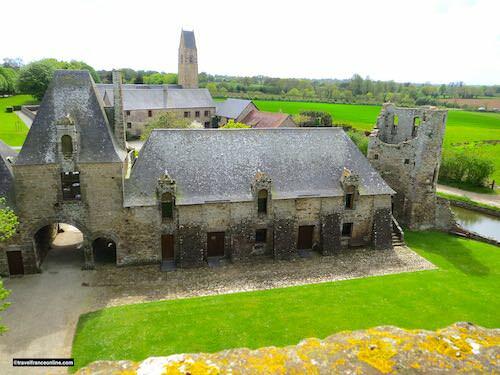 They replaced the original fortified house with a castle and built the Tour Ronde (watchtower) during the Hundred Years War in the 15th century. 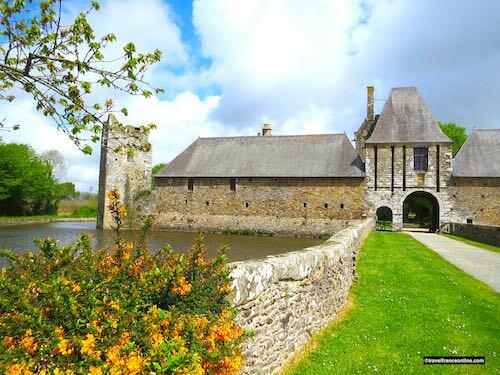 They remodeled their castle and built the Tour à la Fée during the French Renaissance; they widened the moats to allow boat rides and created the four-arch stone bridge Petit Pont that led to the long gone formal gardens; they built the gatehouse and the commons in the 16th century. 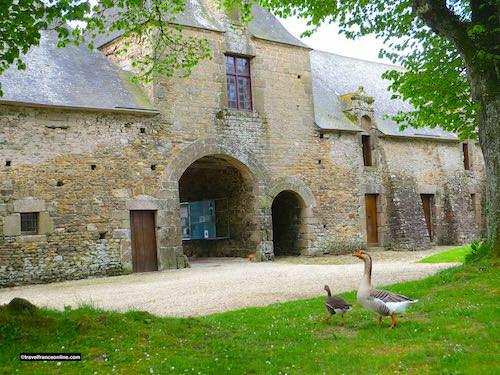 The Marquis Jean-Antoine d'Argouges, the last Baron de Gratot, added the 18th century pavilion, but eventually sold the castle to Bishop Talaru de Chalmazel, Bishop of Coutances. He died ruined and without descendants, but his cousin asserted his rights, refunded the bishop and took residence in the Chateau de Gratot. 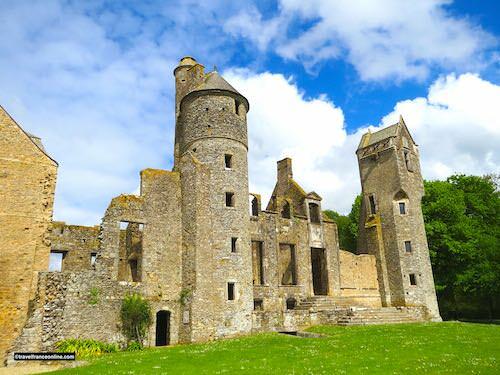 Sadly, the castle changed hands several times over the next 150 years because of succession disputes and financial difficulties, and slowly fell into ruins. A Parisian publisher acquired it in 1910, but died before he could renovate it. Fortunately, Jean Tiphaigne, the farmer attached to the castle, raised the necessary funds and bought the estate in 1925. His children then grandchildren, helped by volunteers, took over in 1968; they have since relentlessly worked on the castle’s rehabilitation and maintenance. Entrance tickets, but also cultural events and festivals finance the restoration program. Several buildings such as the 18th century pavilion, Tour à la Fée, Tour Ronde and commons are today fully restored. The Argouges originated from Bessin, in northern Cotentin; they settled in Gratot in 1251 when they were awarded the barony of Gratot. They introduced the architecture of their county of origin in the late 15th century when they erected the Tour à la Fée. The base of this Renaissance stair tower is octagonal, but a square room tops it; two balustrades, one decorated with acanthus leaves, the other with four-petal roses and a gargoyle, enhance its two-sided roof. Legend has it that one of the Lords of Argouges returned from the hunt and stopped at a fountain to let his horse drink. A beautiful young woman, who was bathing in the fountain, vanished as if by magic at the sound of the horse’s hooves. The young lord returned to the fountain for days on before the woman reappeared. Bewitched by her beauty, he declared his flame and asked her in marriage; Andaine, who was a fairy, agreed to become his earthly wife, on condition that he never uttered the word 'death'. The young lord agreed, and the young couple lived happily for seven years until the young man organized a tournament in the courtyard of his castle. 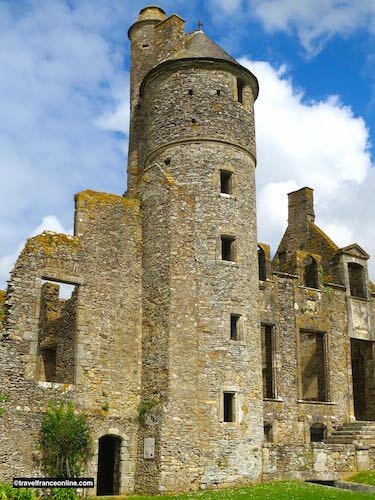 But as Andaine was taking too much time to show up, her impatient husband shouted from the bottom of the tower: “Dame, etes lente en vos besognes, seriez bonne à aller querir la mort" - "Lady, you are slow in your work, would be good to fetch death." At these words the fairy uttered a heartrending cry; she climbed the window ledge and disappeared leaving the imprint of her hand and foot, which are still visible. 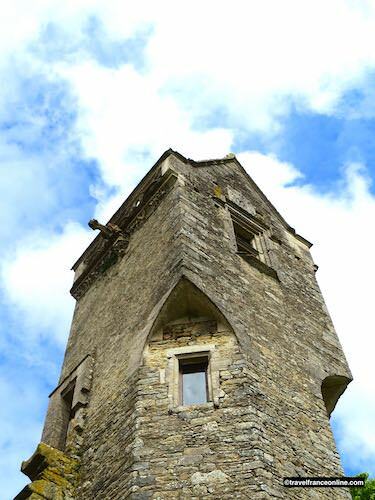 People say that during stormy nights Andaine can be heard at the bottom of the tower muttering the words Death! Death! In the 15th century the Argouges replaced their medieval fortress with a castle, which was destroyed by a fire in 1800. 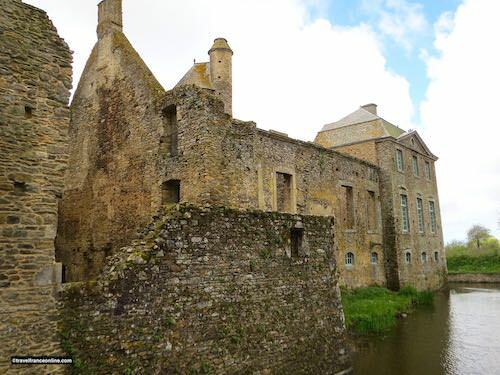 The impressive vestiges of this 3-storey building stretch between the Tour à la Fée, Tour Ronde and the massive North building, a remnant of the 13th century fortified house. The Argouges remodelled the castle’s facade in the 17th century; they opened wide windows, adorned the rooms with stucco and woodwork and built skylights in the attic. They also built a monumental outside staircase to reach the reception rooms. 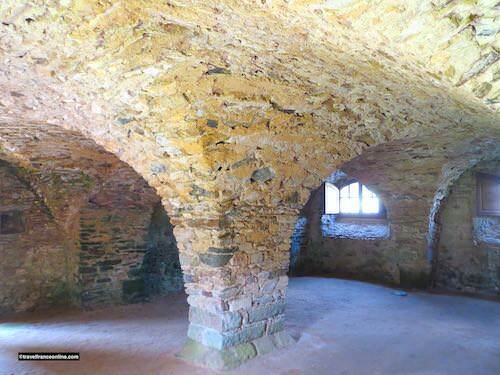 The castle had 15 rooms; the bedrooms and living rooms were on the upper floors; the kitchens, food reserves and the laundry room were in the basement cellars. The latter were repeatedly modified and reinforced over time to support the new buildings. 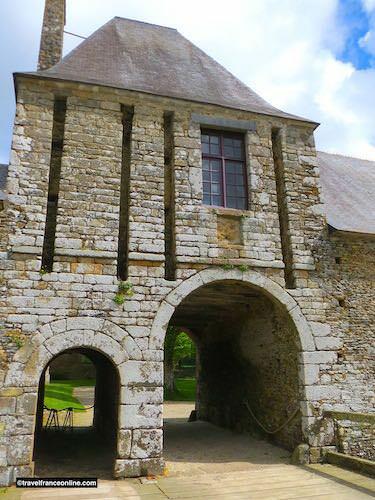 They served as entrance to the castle during the 15th century; they were converted into kitchens 2 centuries later and served all the rooms via the Tour Ronde and Tour à la Fée. 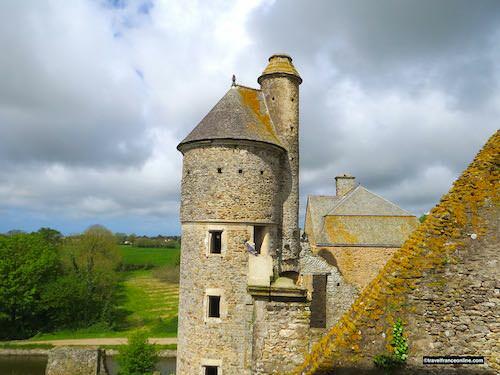 This watchtower topped with a pepper roof was built in the 15th century during the Hundred Years War; the guards lived in the upper room that still has remnants of mural paintings that depict men in armor. This stair tower served all the floors of the castle and the cellars and was one of the castle’s busiest places; the steps quickly worn out and were covered with replacement slabs. The Tour Ronde is also called Tour de l'Horloge (Tower Clock) as it contained a large clock with its ropes, weights and utensils. 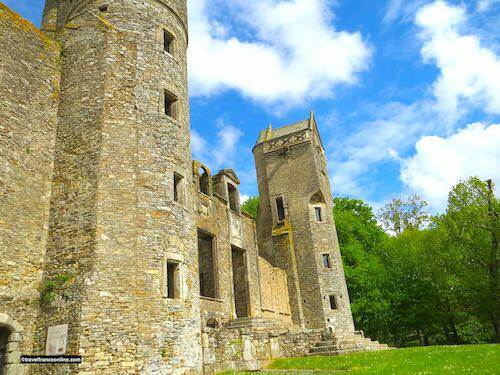 The early 18th century pavilion flanked the castle and the Tour Ronde and was the last addition to the castle. It boasts an elegant Classic architecture: Mansard roof and triangular pediments pierced by circular bull's-eye. The Fiefdom of Gratot became a marquisate in the 18th century; the Chateau de Gratot was classified Historical Monument in 1970. The Cotentin Windmill in Fierville-les-Mines is the only public windmill that operates in the Cotentin region and one of the few to operate in France.